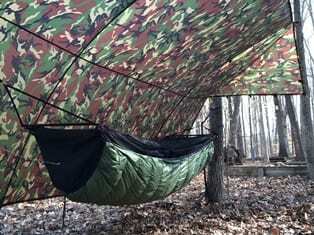 This large JRB tarp is the most capable tarp available for either hammock or ground camps. 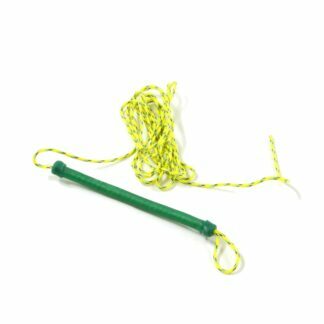 Loaded with perimeter tabs, ridge line tabs, panel pulls, pole grommets and spring pole guides this tarp may be configured to conform to nearly any configuration required or desired. 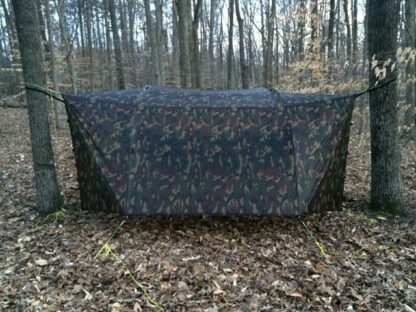 This large JRB tarp is the most capable tarp available for either hammock or ground camps. Loaded with perimeter tabs, ridge line tabs, panel pulls, pole grommets and spring pole guides this tarp may be configured to conform to nearly any configuration required or desired. It is an ideal shelter for large and wide hammocks like bridge style hammocks. It can be pitched in a classic “A” with either open ends, or closed ends for storm protection. Interior volume is easily expanded by use of panel pull tie-outs. Or, interior volume can be increased by the addition of spring poles (separately available) to create either single hoop or a tunnel style shelter. Gathered end hammocks users can arc the center area with a single spring pole. And bridge style hammock users can use two spring pole to create the tunnel style sought by many. In either case the ends may be closed or nearly closed for storm protection. Open pitches like the “Baker” style lean-to or the three sided Adirondack shelter are also possible. In classic “A” Pitch it can easily accommodate 3-4 ground campers with a generous overhang. It can be pitched high and wide for maximum overhead shelter providing almost 120 square feet of overhead cover if needed. 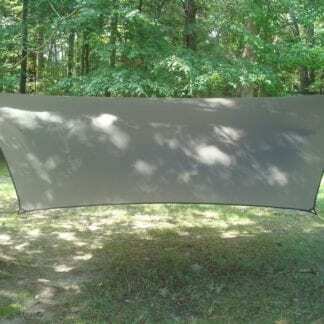 This will accommodate multiple hammocks in close proximity or quick easy coverage over a picnic table for a lunch reprieve during inclement weather. Includes a JRB Medium Speed Sack. NOTE: Ridgeline seam comes sealed with McNett SilNet Silicon Seam Sealer. WARNING: Silicon impregnated nylon is flammable, please use caution near open flame. CAUTION: Nylon will age and breakdown prematurely if exposed to continuous sunlight (ultra-violet light). Do not leave nylon products set up in direct sunlight for extended periods of time. Bought this tarp with two poles for use with my bridge hammocks and my 11′ gathered end. I used it this past weekend at a NH hang, and through a several hour rain storm one night. Nary a drop got through the stitching nor the sealed seams! It felt like a huge umbrella, and afforded me plenty of room to dress, work outside the hammock yet still dry under the tarp. Outstanding value and function! Thanks guys! I was on the same hang as SkyPainter. Unfortunately after I set up my universal tarp my german shepard charged by, snagging one of the tension lines, He torn out an entire corner. The tarp is big enough with a little adjustment I still was dry through the hours of rain. I sent the tarp back to JRB. Hoping they could repair it. A package arrived two days later. They said it was too badly damaged to repair. So with a note to take more care with my dog they replaced it with a new one. Totally unexpected. Thanks JRB. Now it’s time to order a High Sierra quilt for the winter. Just got back from a snow shoe 2 nighter in the Sierra Nevada. Glad I had the larger JRB 12×10 with me. We had 24 hours of non stop heavy wet snow. (Sierra Cement). Tarp took a beating, but kept me dry. Had to beat the snow off the tarp every hour and dig out in the mornings, the tarp sprang back to life everytime and didn’t skip a beat. I pitched over a continuous amsteel ridgeline with prussiks and closed off the door panels. I woke up a few times with the tarp inches from my face cause of the weight of the snow. Now I realize a good sized tarp is critical in foul weather. 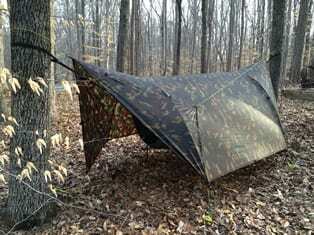 JRB 12×10 is now my #1 winter tarp.